I recently upgraded my glasses and the case they came with doesn’t fit in my small bag so I made a case for them I can take with me and clip on my bag or my iPad carry case. 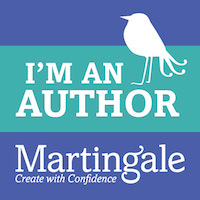 This is a quick project that needed a bit of creative thinking but I’m quite pleased with the results. 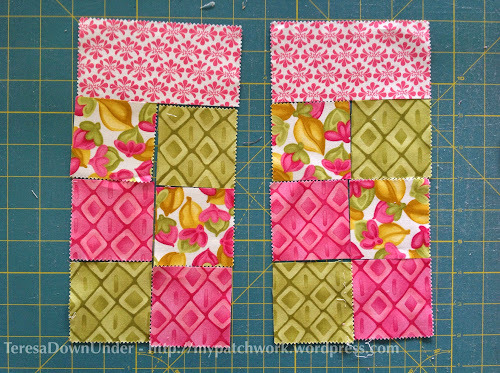 Take 3 charm squares and cut them in half and in half again to obtain 4 x 2 1/2 inch squares per square. Cut another charm square in half. Then place all the pieces as per picture below. Stitch. Cut the batting and pin to the patchwork as per picture. Notice the fold on the top border. Fold in and pin. 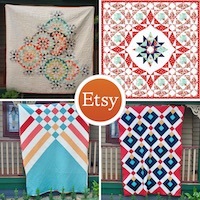 Now quilt any way you like. Stitch along the seam on the top border. Fold the top by 1 inch. Stitch along the seam leaving 1/4 inch allowance. Do the same with both sides. Now place both pieces right sides together and sew together from one edge to the batting to the other. Clip the corners. Now let’s make the tabs. Cut a charm square in half. 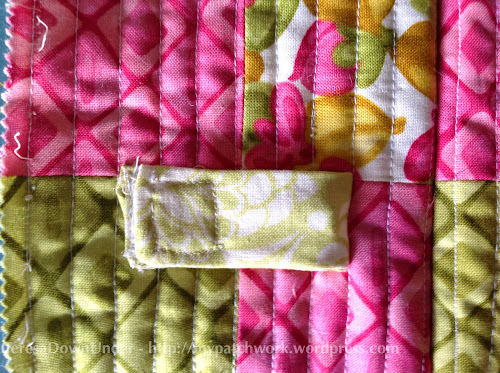 Fold in half and stitch along two sides leaving the other narrow side open to turn inside out. 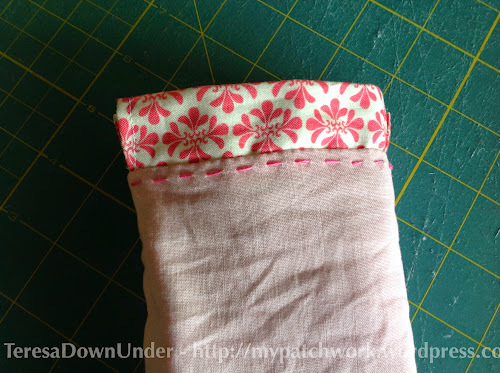 Turn inside out and then fold the opening in and stitch along the seam. Do two tabs in this way. Now attach a small piece of velcro to each end as per picture. Place on one of the slipcase sides. Ignore how both pieces are stitched on one side. I made a mistake. We’ll stitch the bag later. When well centred pin the tab. Now stitch from the middle of the tab all around. Now make a small incision to insert the hair pin. Make sure the incision is in the right location as both ends of the velcro need to reach to form a closure. 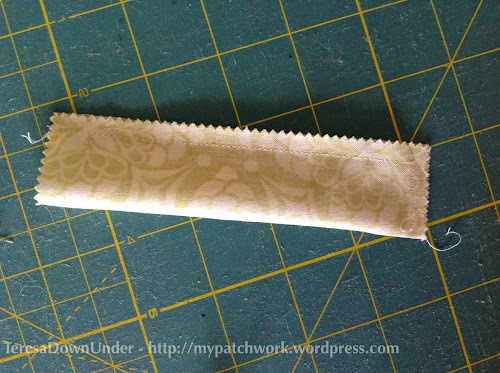 Now fold over the tab to cover the hair pin. Do the same for both tabs. 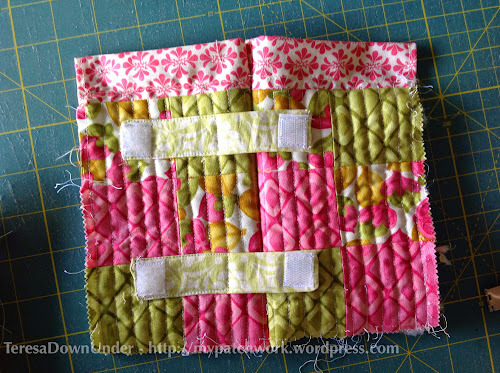 Place both panels with right sides facing together and stitch all around from the top border seam on one side to the other. To add the lining, cut both pieces. Then stitch around 3 sides and clip corners as per picture. Turn the lining inside out and the exterior inside out as well and place the exterior inside the lining as per picture, wrong sides together. Fold in the lining and pin. Slip stitch around the top. I thought of adding a bit of embroidery along the top, just for fun. But I don’t recommended. My glasses get stuck on the thread all the time. Now insert the purse frame. Insert the little metal tube and clip both ends of the frame. 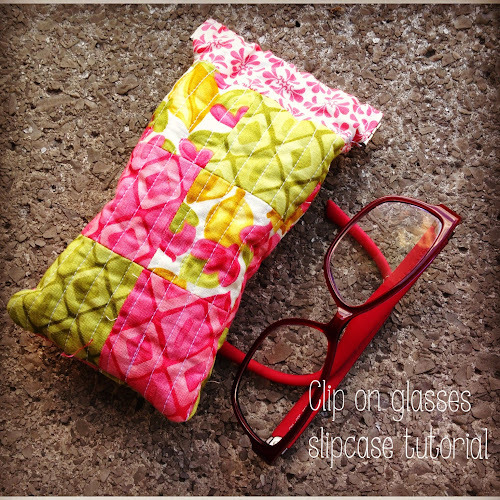 The glasses case is finished. Clip your case to your bag’s strap. This is how I have been wearing the glasses case. 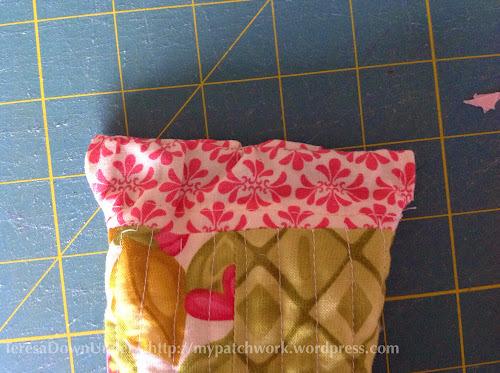 A couple of tutorials back I made a very simple coin purse. 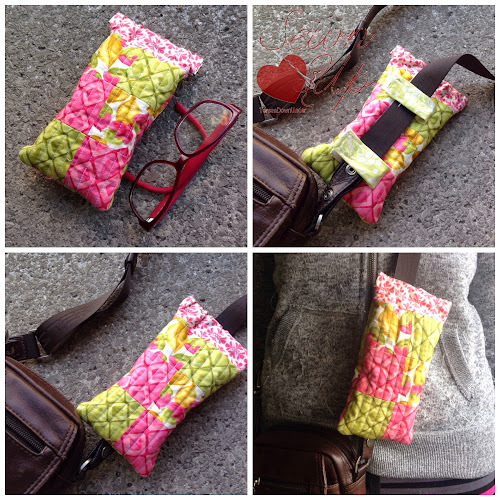 This time the coin purse is a bit more involved but it’s still an easy purse to make. 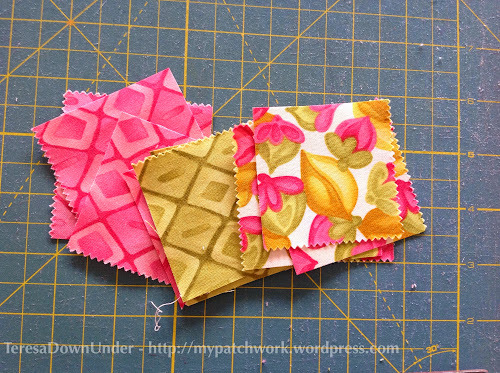 Print hexies pattern and cut 57 shapes. 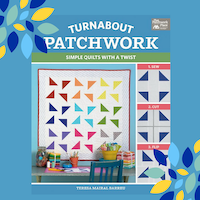 Now, if you’ve never made a hexagon before check out my Scrappy flower hexagon quilt for instructions on how to make them. 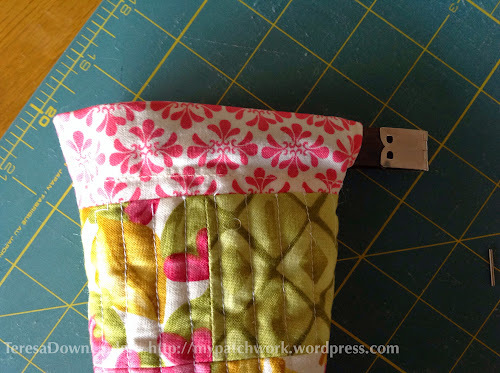 Keep the papers in until you finish stitching the hexagons in the required purse shape. 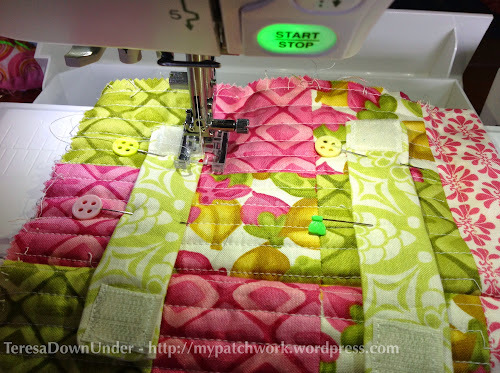 Print the purse pattern and place over the hexies to make sure it is big enough. If your hexies are printed accurately there shouldn’t be any problem. In any case, adjust the size of the purse if necessary. Place the pattern over the back of the hexies pieces. Now cut the lining pieces. 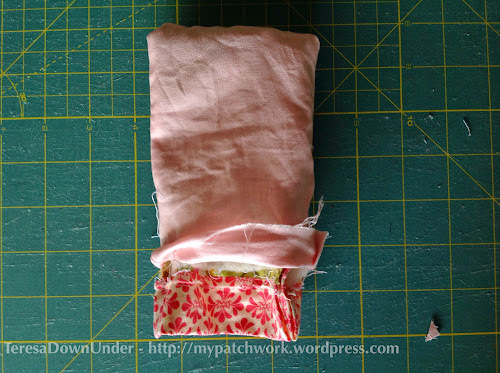 Fold the lining in half to cut both pieces at the same time. 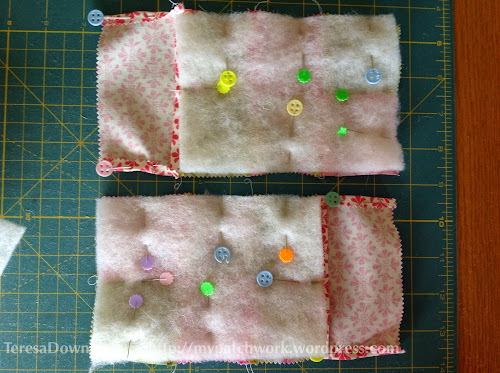 Cut the fusible interfacing in the same way. 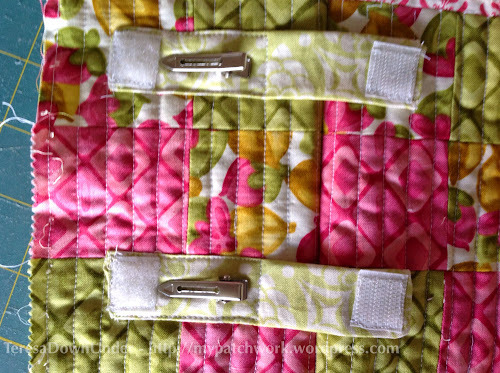 Iron the fusible interfacing to the wrong side of the purse exterior. Now make two markings where the purse hinges end. Place both pieces right sides facing together and pin. Do the same with the lining pieces. Pin and stitch from marking to marking. Now stitch marking to marking the exterior. Time to trim off excess fabric and pinking the curved sides. Trim to about 1/8 inches from the edge. Do the same with the lining but this time leave a 1 1/2 inch gap on the bottom to turn the purse inside out. Now let’s stitch exterior and interior together. Place the exterior inside the lining as per picture. Align the lining and exterior curves well. 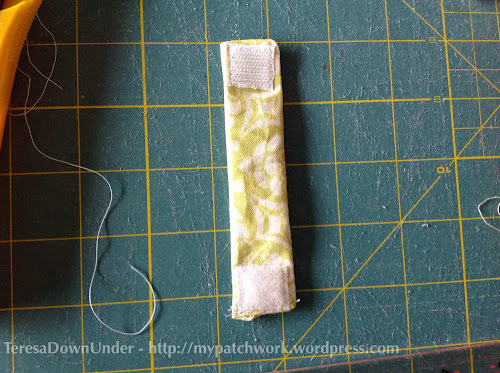 Stitch around the curve on both sides and trim off excess fabric and make some cuts as you did before. 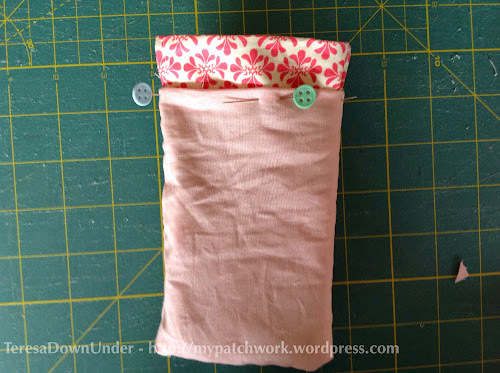 Turn purse inside out through the opening in the lining. Stitch the bottom of the lining. 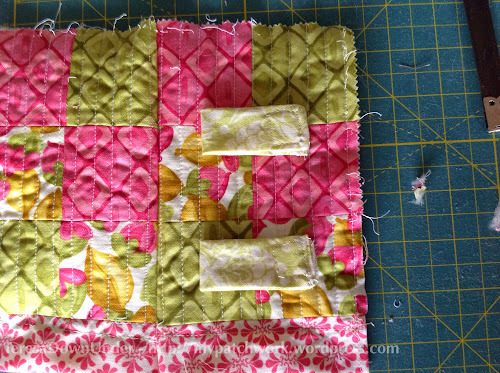 Now attach the frame with matching stranded cotton. 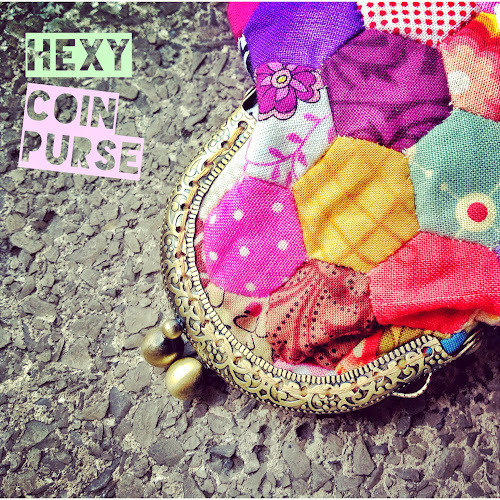 The hexie coin purse is done! 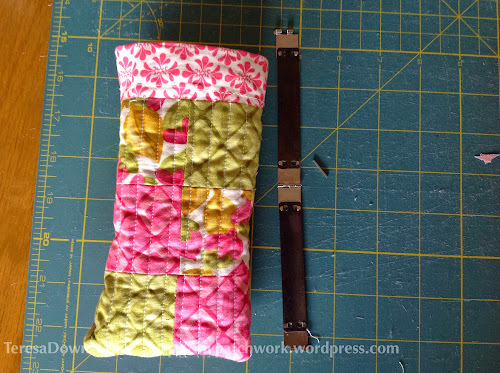 This tutorial is for a 3 1/2 in purse frame. If your frame is a different size you can adjust the pattern to suit your frame. The pattern is very simple to draw. Decide how high you want your purse to be. Then place the frame over a piece of paper and draw around the top of the frame and then down the sides to your desired height to form a rectangle. Add half an inch to the height as the boxing of the purse will take about 1/2 in off the height. Trace the bottom line. You will have a rectangle. Now just add a 1 inch gusset to each side and trace a line. Your pattern is drawn. If you need more details you can use the instructions for Paillette evening bag which is the tutorial I followed to make my coin purse. 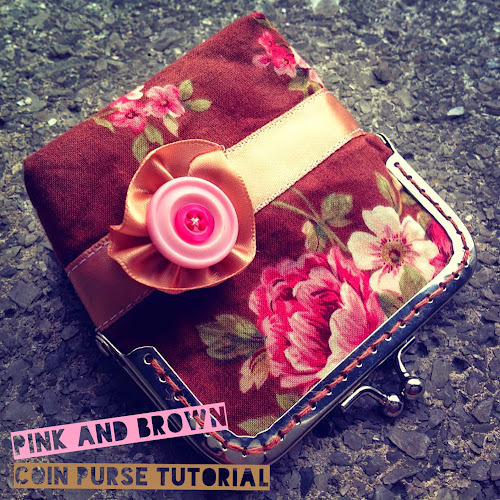 Download Pink and brown coin purse pattern (pdf), print and cut out. Now place the frame over the pattern. Draw a line on each side to mark the hinge of the frame as per picture. 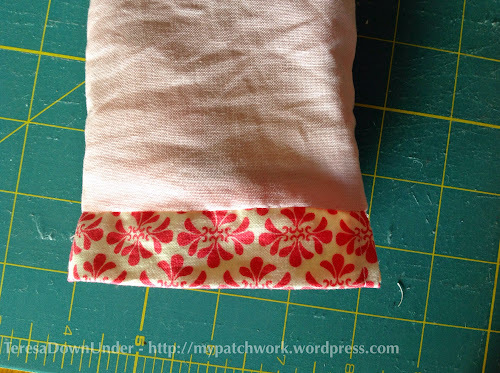 Now fold your fabric and draw the pattern on the fabric. Pin. Make a 2 inch mark on the bottom edge. 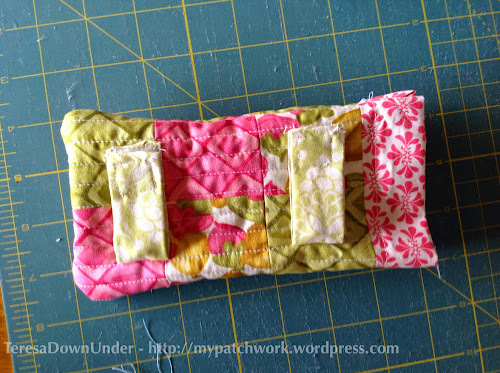 This will be open when the lining is stitched so that the purse can be turned inside out. Make a mark on each side for the purse hinge as per picture. 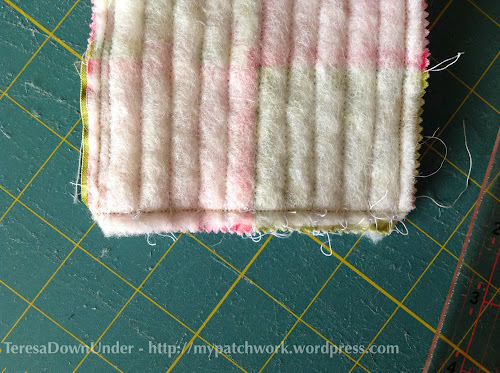 Stitch around the lining from the hinge mark to the opening mark on each side. The outside is one single piece. 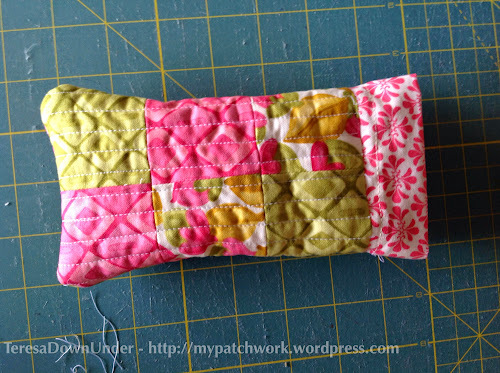 Place the pattern on the fabric fold as per picture. Cut around top and sides of the pattern. 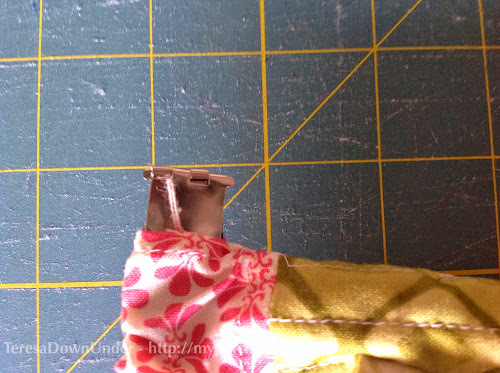 Make a mark on each side for the purse hinge. 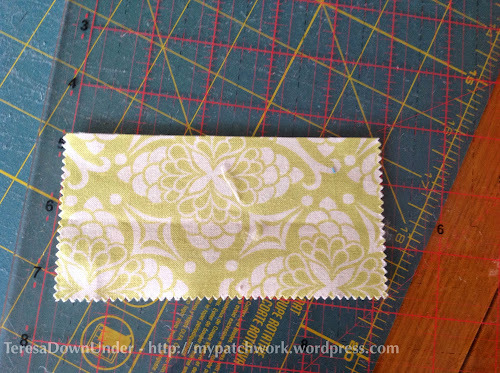 Cut a piece of fusible interfacing slightly smaller than the exterior and iron it to the wrong side of the fabric. Take a piece of ribbon and pin through it at large intervals to make a gathering. Pull and make a flower with it. Make a small stitch where the edges meet. 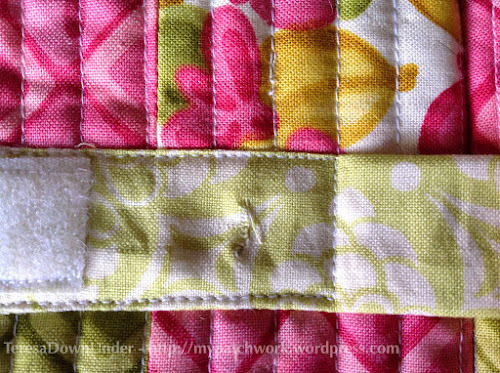 Cut a piece of ribbon and stitch it to the outside just below the hinge mark. Fold with right sides facing together. And stitch on both sides up to the hinge mark as per picture. To box the bottom of the purse, open the corner as per picture and make a mark at 1 inch. Now you can box the lining as well in the same way. The lining and exterior bags are done. Turn the outside piece inside out. Leave the lining as is. Place the outside piece inside the lining as per picture. Pin well all around the top opening. Stitch at 1/8 in from the edge. Turn the bag inside out through the lining opening. 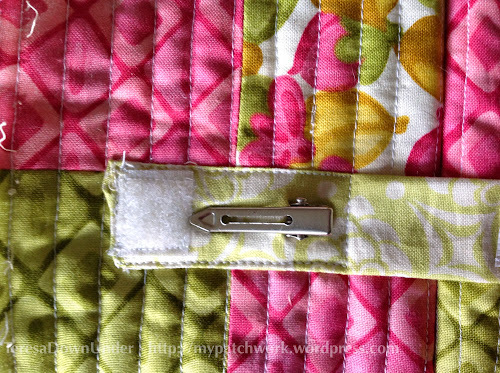 Pin along the opening in the lining and stitch. 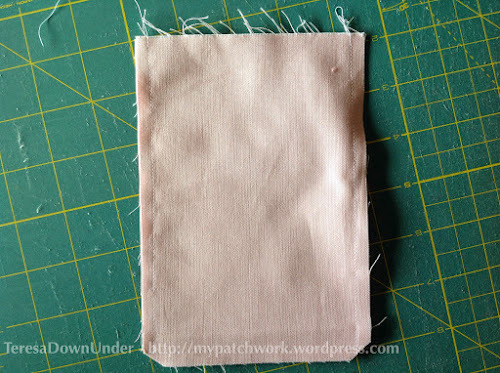 Stitch the frame to the purse with some matching stranded cotton. 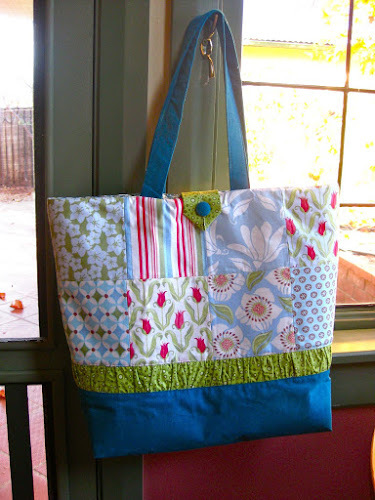 Are you looking for a free pattern for a large bag? 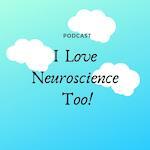 Here you have 4 free tutorials to choose from. 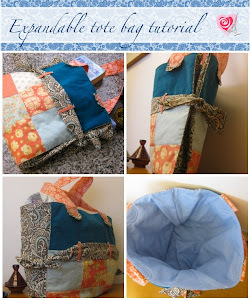 All 4 bags use 5 inch charm squares and are easy to make. Perfect as gifts for family and friends. 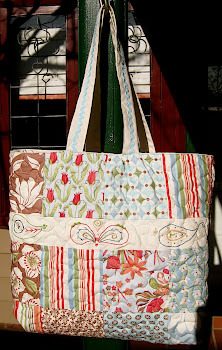 If you have made a tote bag using this tutorial, why don’t you share your pictures on this Flickr group? 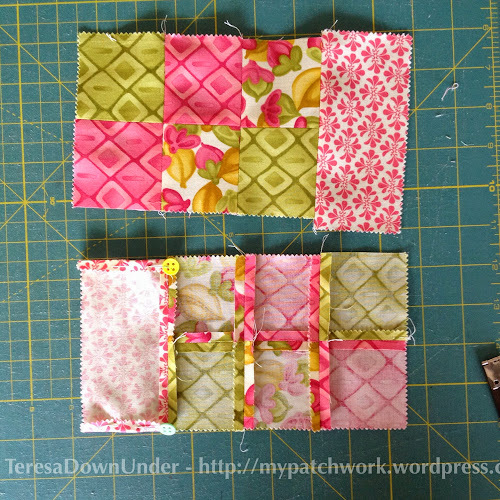 For each side of the bag, stitch 2 rows of 4 charm squares each and then 2 rows together. Iron with seams open to get a flatter look. 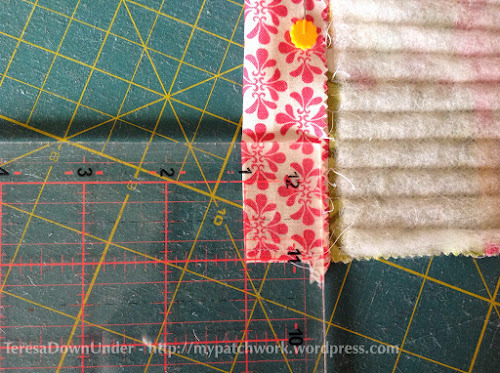 You will end up with 2 rectangles measuring measuring 18.5in x 9.5in but measure your final rectangles well after sewing before you cut the bottom rectangles so that the width is the same. From the matching fabric cut 2 more 8in x 18.5in rectangles to form the bottom of the bag. Cut 2 pieces of 21in x 4in for the handles. 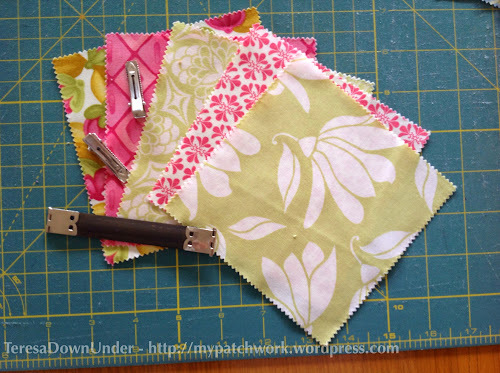 Cut 2 pieces of fusible interfacing slightly smaller than the handles and iron to each piece of fabric. Fold as per picture below and iron. Stitch very close to the edge on both sides of the handle. Cut 2 strips of fabric measuring 2.5 in x 36 in. 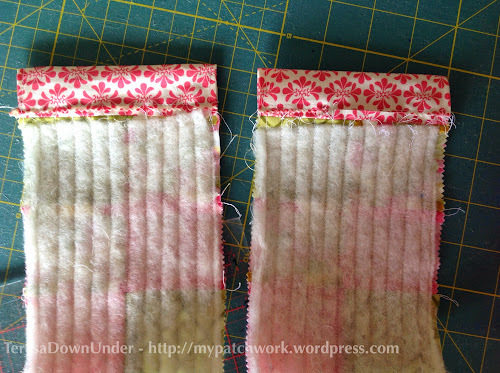 Using basting stitch, sew along the sides of the strip. Pull from the top thread while you hold the strip of fabric. 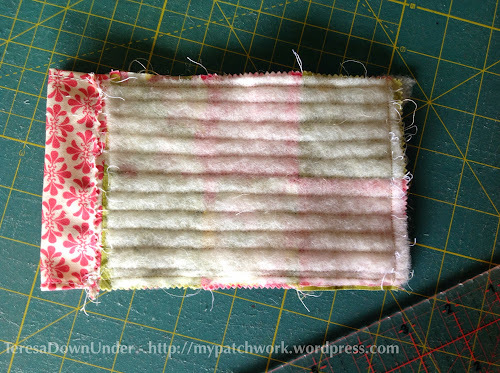 Pull from both sides and distribute the folds along the whole strip. When the folds have been evenly distributed, iron the folds a bit, though this steps is not necessary. You are now ready to piece the bag. 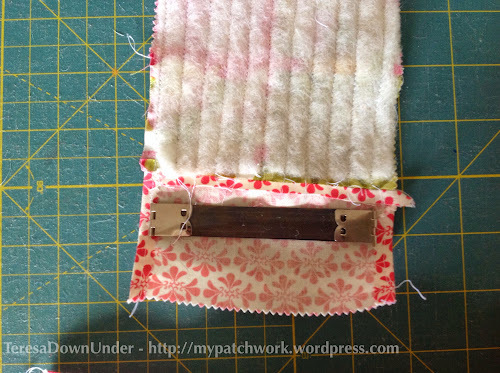 Pin the gathered strip of fabric to the charm packs which have already been pieced and stitch. 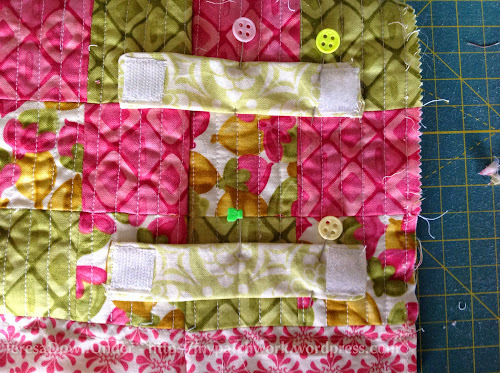 Pin the other side of the gathered fabric to the bottom fabric and stitch. Now you have one side completed. 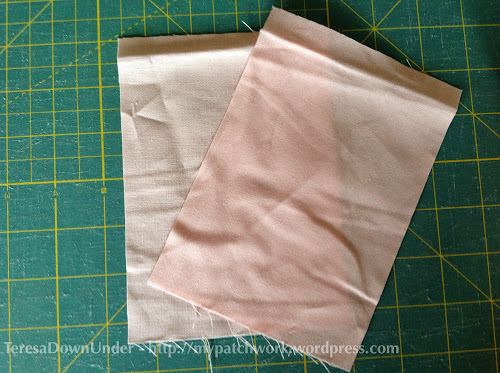 Cut a piece of fusible interfacing (medium to heavy) 1/2 in smaller than the sides of the bag. Iron to the back of each side of the bag as per instructions. Cut a rectangle measuring 6.5in x 4in for the loop closure. Make a tube as per handles instructions. Fold and stitch as per picture. Stitch loop as per picture. Cut a piece of batting slightly larger than the sides of the bag and pin. Stitch across the sewing lines from the right side of the fabric. Put both sides together with right sides facing together and stitch around 3 sides leaving the side up open. 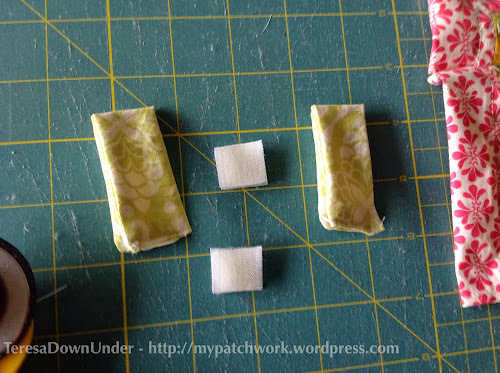 Fold the bag as per picture and make a 2 1/4 wide cut across. Turn inside out. You have finished the bag. Then do as for the outside bag: cut across the corner 2 1/4 inches as per picture and stitch again. Pin loop closure and handles to the bag as per photo. Place the lining over the outside bag as in the photo. The opening showing is the photo is about 4inches wide and will be used to turn the bag inside out once the lining and the outside a sewn together. Stitch lining and bag together. Turn bag inside out through the opening in the lining. Stitch across the top of the bag as per picture.